#EndViolence. This simple hashtag, which has trended on multiple occasions, wouldn’t be that popular in Latin America if conventional wisdom about crime and violence were 100 percent right. One way to look at it is this: where development is low and poverty is high, people are more likely to break the law and commit violent acts. Conversely, less poverty and more development equal less crime and violence. And yet, despite unprecedented levels of economic growth and poverty reduction in Latin America and the Caribbean over the last decade, the region still experiences high levels of crime and violence. Between 2003 and 2013, the region cut extreme poverty by more than half, to 11.5 percent, and overall poverty decreased dramatically (from 42 percent to 24.1 percent). For the first time in history, the region has more people in the middle class than in poverty. However, this dramatic improvement in the quality of life and livelihoods of millions of Latin Americans didn’t translate into the region becoming a safer place. It should come as no surprise that the number of Latin Americans citing crime as their top concern has tripled during the latter half of this decade. According to the public opinion database Latinobarómetro, more than 40 percent of Latin Americans worry “all the time or most of the time” about becoming victims of violent crime. Just from a social point of view, imagine the toll on communities who have to live behind fences and bolted doors; where even going to the park becomes a stressful experience rather than a communal one, in which people interact and bond. The relation between development and crime and violence is a two way street. On the one hand, we cannot say that growth and social progress have no impact in reducing crime. On the other, crime and violence certainly do impact development. Although it is almost impossible to put a price tag on it, crime and security cost private firms in Latin America about US$144 billion in 2010. More broadly, the Inter-American Development Bank recently estimated an annual cost of US$261 billion for the region. What is behind this 21st century “epidemic”? Drug trafficking and organized crime, weak institutions and a lack of opportunities and support for at risk youth are among the main culprits. That’s why there’s no silver bullet. No increase in law enforcement, or education and job opportunities alone would resolve the problem. All of the above need to be part of a comprehensive solution based on PREVENTION. Adopted as an ongoing strategy, prevention can really have an impact in crime reduction. 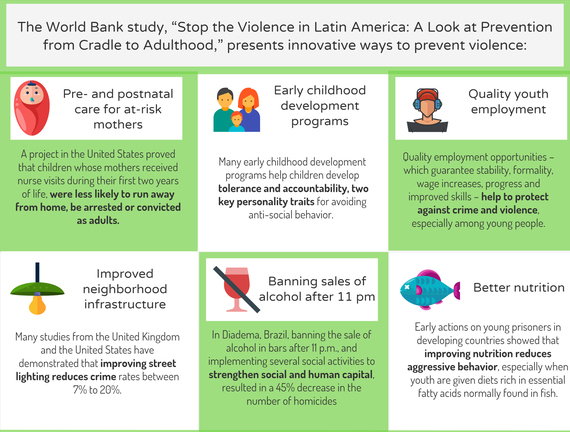 Our new study Stop the Violence in Latin America: A Look at Prevention from Cradle to Adulthood is a significant contribution in this respect. 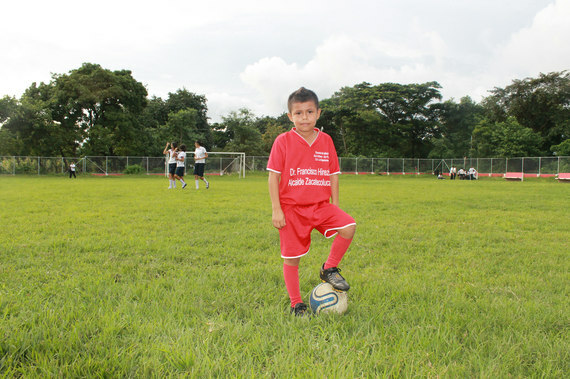 It looks at what has worked, both in Latin America and elsewhere. 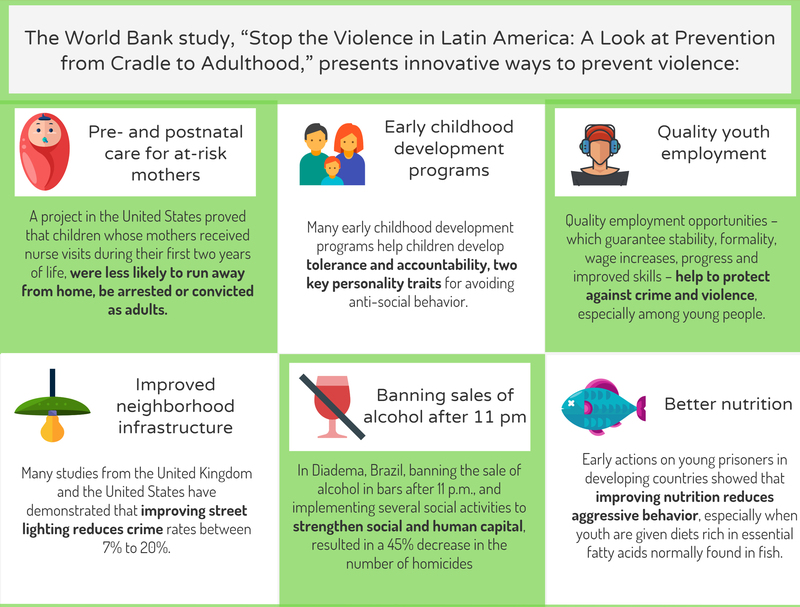 From early childhood programs to greater opportunities for quality employment for youth, a comprehensive approach towards violence prevention is what seems to make policies successful. And, for this to work, it goes without saying that crucial institutions, such as the police and the justice system, need to be trustworthy and reliable.